As a child, I thought I was an artist. Not just creative or talented, I’m talking full on artiste. I could make anything out of pipe cleaner (why did ALL childhood art projects revolve around pipe cleaner?!) and to this day my mother still hangs the ornament on our Christmas tree that I made in the 3rd grade of my smiling face plastered atop the glittered lid of a tuna can. (I am still baffled that none of the teachers in my art class seemed concerned by our use of razor sharp curved edges as materials). Through the years I began to realize that, truthfully, I was not as artistically gifted as my parents and teachers led me to believe. That being said, I still consider myself to be a “former” artist; therefore, I can recognize and appreciate the true talent of others. Enter: artedemirar, a Spanish artist with true Insta-talent and Insta-fame – she has a mere 54,000 followers. 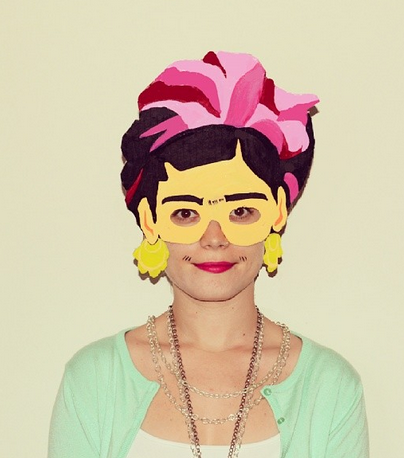 Her Instagram account is simple but her creations are anything but. Each day, she posts a different picture of herself donning her latest and greatest “character:” masks made entirely out of cardboard and paint. All vibrantly colorful and playfully fun, she draws inspiration from her followers (she has a few) and often makes creations based on the requests of these faithful strangers. With 170 posts already under her belt she is making her way through her 365 day mask making challenge. What I can only imagine takes a fair amount of time, energy, patience and cardboard from her is all done in the name of bringing a smile to all of us. In my book, she’s definitely one to Insta-follow. A few of her creations, below.